As I entered into Treeline Urban Resort Hotel, a huge installation that stood in front of the reception desk immediately caught my eye. It looked like it was made of grains from afar. But when I went near, I realised that the sculpture was made of bamboo, wood, wire and metal. It’s called “Ordette”. 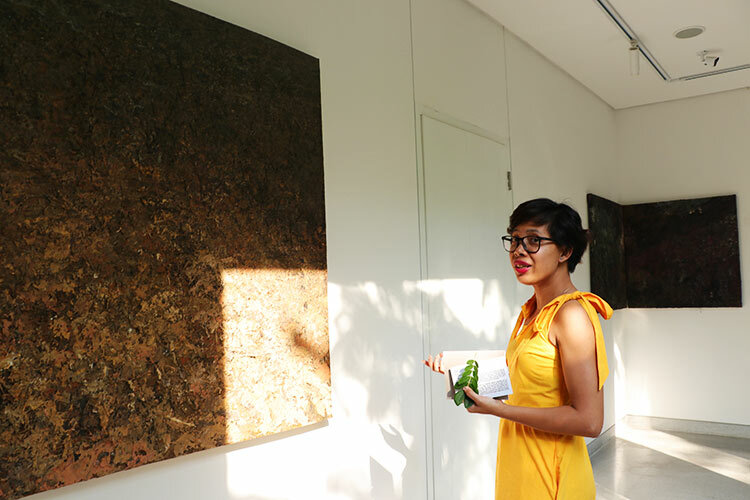 Slowly, I went inside the beautiful resort hotel in Siem Reap and was amazed at the pieces of art – big and small – arranged in the lobby, in the corners and in the garden of Treeline. But the beauty that I saw didn’t come as a surprise. When I knew I was going to the “Face Forward” art exhibition, I knew I had to expect the unexpected…in a good way. I was particularly astounded by another sculpture made of similar natural materials. On the right wall at the hotel lobby, an installation that looked like branches of a tree easily became the apple of my eye. 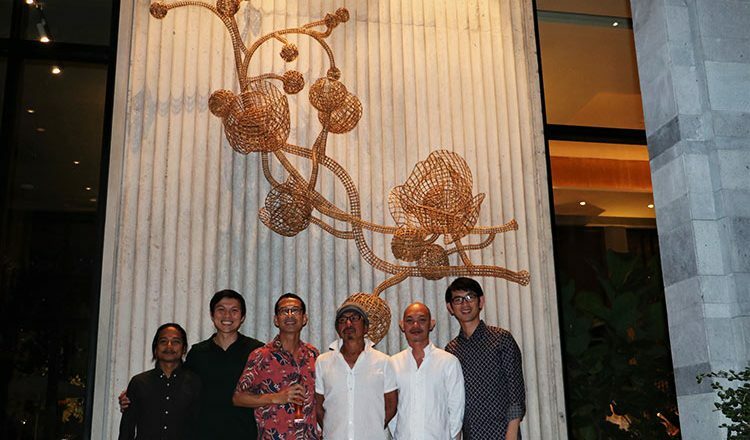 “Rang Phnom”, as it is called by its artist Sopheap Pich, is made of rattan, metal and wire. Its wires were shaped distinctly, making it look like either branches or a crawling entity. But I was told immediately that Rang Phnom truly does represent a tree’s branch. Across Rang Phnom was another installment that one may easily think of as an expensive embellishment of the hotel. But “Under the Tree” was actually an art by Than Sothea. His work was made of palm leaf, copper, steel, stone and hem. He used these local materials to create a representation of trees – thousands of them – hanging on a tree. What’s more amazing about Sothea’s work is the stone he attached below his leaves. The stone represents a seed. And as if those were not enough to make anyone of us an art lover in an instant, there were other equally beautiful and mesmerising installations around the hotel. All the installations, though created by different talented artists, all symbolise a tree, which is inarguably a symbol of life on Earth as well. As I walked further to the front, I saw five contemporary abstract paintings neatly hung on the wall. Other works of art – such as bowls, broomsticks and paddles – were arranged beside the paintings. Not very far from it were the five manmade “Apsara” made from hem and steel that stood steadily as if they were looking forward. I was fortunate to talk with art curator, Meta Moeng, who was responsible for gathering all the astounding art pieces into one place and making them available to the public’s eye. 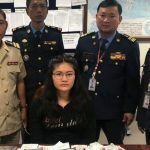 Meta, 33, said that the art exhibition, Face Forward, featured artworks from five local artists who have, individually, made a name for themselves in the art scene here in Cambodia and in other countries. As Meta and I toured into the different art pieces, she explained to me the inspiration behind each magnificent work of art. “Ordette” and “Rang Phnom” were made by acclaimed artist Pich Sopheap, a Battambang-native who gets inspiration from Mother Nature. 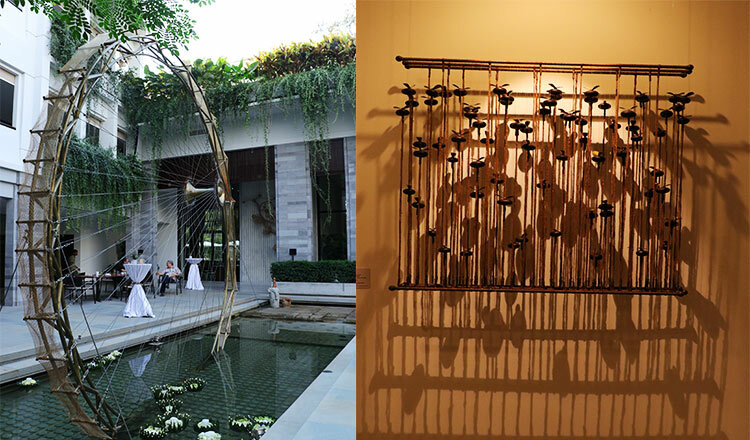 “Looking out from his studio, Sopheap is attracted by every inch of Rang Phnom tree and its flower nearby the window. Because of his curiosity, he later found out this tree has a very long story. It was first grown in US and was later exported to Sri Lanka. As Buddhists, we know that Buddha was born under that tree. It then spread to Southeast Asia along with the spread of the religion,” explained Meta. Aside from Sopheap’s works, “Under the Tree” and six other interesting installations namely “Forest” and the five “Apasara” were from self-taught artist Thang Sothea. Sothea’s arts were also inspired by nature. Sothea drew inspiration from the Angkor temples when he created the five pieces of Apsara sculptures. But as soon as we stood in front of Nov Cheanick’s “Impermanence” acrylic painting, Meta refused to explain its meaning. “This art is called abstract. There is no judgment on how you interpret this. There’s no right or wrong. You just have to open your heart and feel it. I can also be part of your memories or of your past,” said Meta. We walked to the garden of the hotel and saw the surrounding trees, the elephant sculptures and the huge cosmic wheel. The elephants, Meta told me, were made by Asasax. The artist was said to have drawn inspiration from history. Commissioned by Treeline, he went to bring stone from Kulen Mountain to create his elephants. And the huge cosmic wheel installed in one side was from Cambodia-based architecture studio HKA & Partners. As a long-time curator, Meta admitted that there has been a decline in exhibitions and collections of art pieces from local artists. But with Treeline’s initiative to give its spacious hotel to artists, more and more sculptors and painters will be inspired to expose their arts. “And for those who like the art pieces, I encourage them to go see the studio of artists because they will surely appreciate their works. Each piece tells different story of life,” Meta said. “Face Forward” exhibition, which started in January 26, wouldn’t be a success if it weren’t for the effort and support of pioneering visionary architect, Hok Kang. “I did not know how to start to be frankly,” Hok Kang admitted, as his professional background is in architecture. “But what I know is that Siem Reap is a province of arts, architecture and food. I wanted to make arts and design a hotel. Treeline Urban Resort Hotel is going to have four exhibitions per year, with varying themes, in its “Treeline Art Gallery”. “Face Forward” exhibit runs until March 31.